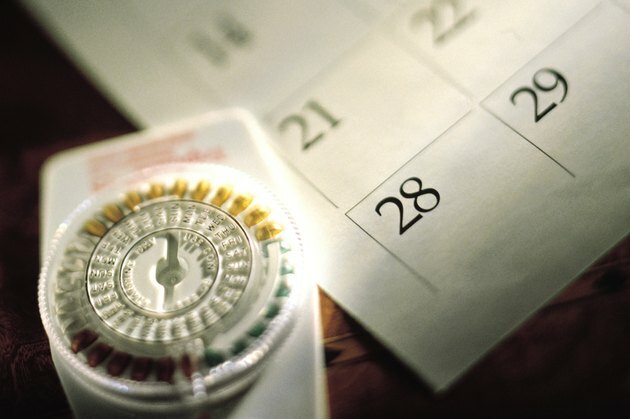 Hormonal contraceptives, including the classic birth control pill, shot, ring, patch and "minipill," are very popular methods for preventing unplanned pregnancy. In general, hormone-based birth control methods are safe and associated with few side effects or drug interactions. Birth control pills are not known to interact with probiotics -- "friendly bacteria" sold as nutritional supplements for their purported health benefits. Women taking birth control pills -- or use any other type of birth control -- can safely ingest probiotics without either product negating the effects of the other. Hormonal contraceptives and probiotics operate within the human body with completely different, independent chemical properties. Birth control works by delivering a steady dose of estrogen and progesterone, two female reproductive hormones. This prevents the woman's eggs from maturing, so they can not accept sperm or become fertilized. Probiotics are not known to impact levels of any human hormone. They work by emulating the beneficial microorganisms found naturally in the human body, aiding in digestion, immunity and pH balance. Although generally safe and effective, contraceptives do interact with some supplements and prescription drugs. Several antibiotics and anti-seizure drugs reduce the effectiveness of hormonal birth control. Nutritional supplements and alternative medicines, including herbs such as chasteberry and Saint John's wort, can also hinder a contraceptive's capacity to prevent pregnancy. However, no major medical establishments acknowledge a potential interaction between probiotic supplements and birth control. Probiotics, including the popular bacterium Lactobacillus acidophilus, rarely interact negatively with prescription medications. Probiotics could increase the rate at which the body absorbs sulfasalazine, which is a drug used in the treatment of inflammatory bowel disease. Antibiotics can reduce the effectiveness of probiotic supplements, and that immunosuppressants could increase the risk of probiotic infection -- a rare, but serious, side effect. Neither organization reports any interaction with any form of contraception. Probiotics are unlikely to positively or negatively affect the safety or efficacy of birth control. However, women using hormonal contraceptives should always consult qualified medical experts before taking any supplement or natural medicine. Many naturopathic supplements have not been extensively studied, and their exact impacts on human biology remain poorly understood. Professional guidance is essential for women who are interested in combining naturopathic medicines with prescription medications, including birth control. Does Taking Probiotics Help to Reduce Weight?